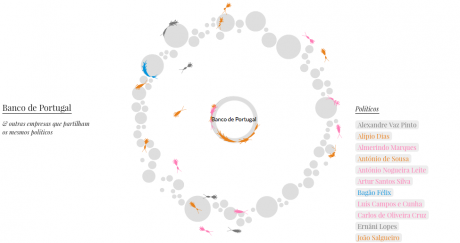 An ecosystem of corporate politicians is an interactive online visualization of the relationships between members of Portuguese governments and companies for the period of 1975 to 2013. The aim of this project is to create awareness of these relations for the Portuguese public, and by using a highly figurative depiction, captivate this audience and bring this reality from the usual purely notional descriptions to a concrete visual form. It is a visualization of citizen journalism and social intervention, that given the national discontent with the politicians of the ruling arch, can currently find an eager interest from citizens, journalists and political activists. The visualization can be accessed here. Visualization time does not represents a chronological scale, but instead it was preferred to display every politician and company at the same time in order to emphasize the frenetic traffic of politicians in-between companies. Data is approached as an ecosystem, where each set of interdependent relations are regulated by physical conditions — each politician has a sequence of companies to visit, chasing them and jumping between them, in order to restart the sequence each time it is completed. Companies are circles with an area proporcional to the number of different politicians that had a position at that company during 1975-2013. That way, bigger circles represent companies had more politicians. Politicians are simulated as living organisms, having a set of companies to visit, encircling them for an amount of time proportional to the duration of their specific positions at the company. The color of each politician is based on its latest political party affiliation, such as socialists, social-democrats and conservatives. In cases where the political affiliation could not be defined, politicians are left gray. The anatomy of a politician is related the number of unique companies that he has to visit, as shown by the following image. In addition to visualize every relation in this ecosystem simultaneously, it is also possible to explore traffic universes of first order. By clicking on a company, one can isolate its ecosystem, displaying only the politicians that had a position at that company and also displaying other companies that had the same politicians orbiting around the selected company. By clicking on a politician one can visualize his path between companies, as well as get access to his positions in governments and respective political affiliations. The data was collected from a study of politics and businesses done for the documentary “Donos de Portugal” which covers the relations of ministers and secretaries of state of Portuguese governments with companies, roughly from 1975 to 2010. This study was complemented with our own research of their positions in companies until 2013. In addition, other politicians and companies were added from an “Exploratory study about political connections of stock companies in Portugal”, and another hand full that we deemed relevant but always with high governmental positions (ministers, secretaries of state and prime-ministers). It should also be noticed that the gathered information was always included from public sources, such as companies’ governing bodies available online, companies’ public reports, news from the online press and public résumés. This resulted in more than 130 gathered politicians and more than 350 companies that are still being added to the system. Although this data is only a sample of the real dimension of traffic between companies and governments in Portugal, it is indeed highly illustrative of the subject. The visualization received about 130,000 visits in 70 days with an average of 1,828 visits per day, of which 55% are direct hits and 36% originated from social shares (mainly Facebook). It received positive reviews from the blogosphere, through direct comments on the visualization’s website and it was featured on the front page with two spreads on a major Portuguese newspaper — Os donos de Portugal. Agora em versão ecossistema interactivo. Jornal i, year 5, n. 1462, 4 January 2014, pp. 16-19.